We no longer have tickets available for the Civil Rights Summit. We will not offer standby lines for those without tickets to Summit sessions. Questions about your ticket reservations? Please visit support.frontgatetickets.com. Please be aware that LBJ Presidential Library events may be filmed and/or photographed. Your attendance constitutes your authorization for the LBJ Presidential Library to use your photograph, voice, or other likeness for purposes related to the Library, including but not limited to marketing and promotion in both print and electronic forms. Please click here to see a list of frequently asked questions about the Summit. Aplril 6, 2014, 9:13 P.M. The links below will be live 10 minutes before each panel start time. LBJ Library Civil Rights Summit - Day 1 - Morning Panels (12:30-4:00 pm CDT). WATCH. LBJ Library Civil Rights Summit - Day 1 - Evening Panel (6:00-7:30 pm CDT) WATCH. LBJ Library Civil Rights Summit - Day 2 - Morning Panels (12:30-4:00 pm CDT). WATCH. LBJ Library Civil Rights Summit - Day 2 - Evening Panel (6:00-7:30 pm CDT). WATCH. LBJ Library Civil Rights Summit - Day 3 - Morning Panels (11:30-4:00 pm CDT). WATCH. LBJ Library Civil Rights Summit - Day 3 - Evening Panel (5:30-8:00 pm CDT). WATCH. To allow everyone to enjoy the Civil Rights Summit, April 8, 9 and 10, 2014, the LBJ Presidential Library—in collaboration with Google and Longhorn Network—will live stream each of the Summit programs on our website, CivilRightsSummit.org. Television coverage* will be available on Longhorn Network (LHN). LHN is available on Time Warner Cable (Texas), AT&T U-verse TV, Charter Communications (Arkansas, Louisiana, New Mexico, Texas, Virginia), Cox Communications (Arkansas, Kansas, Louisiana, Oklahoma), Grande Communications, Google Fiber (Kansas City), Verizon FiOS, Consolidated Communications, En-Touch Systems, E-Tex Communications, Bay City Cablevision, Mid-Coast Cablevision, Valley Telephone Cooperative and Texas Mid-Gulf Cablevision. LHN is also available to authenticated subscribers of the network via LonghornNetwork.com and the Longhorn Network iOS app. On The University of Texas at Austin campus, the Summit will be broadcast on Channel 11, with open captions on Channel 07. The Longhorn Network is also available on campus CATV digital channels 444 (SD) and 1593 (HD) and, in the Residence Halls, CATV system channel 29. *Longhorn Network will present the Conversation with The Honorable Jimmy Carter on Tuesday, April 8 at 11 p.m. CT, with an encore presentation Wednesday, April 9 at 4:30 p.m. CT.
Backpacks, tote bags or any bag larger than 12 inches in any dimension will not be allowed into the LBJ Auditorium. All bags are subject to search by security personnel, including purses, camera cases and diaper bags. Those with larger prohibited bags will be turned away. Do not bring any packages that can not be opened or inspected. Thank you for your cooperation. Sign language interpreters will be available during the Summit. Those who need ADA accommodations should contact Judy Allen at judy@lbjfoundation.org no less than five business days prior to the event. O's Campus Café, located in the lobby of the Lyndon B. Johnson School of Public Affairs, will be open from 8:00 a.m. until 6:00 p.m. on April 8-10. O's offers a variety of sandwiches, salads, snacks, and drinks. A menu is available online. Members of the Public are invited to book signings in the Lobby of the LBJ Presidential Library. Civil Rights Summit tickets are not required to attend book signings. No outside books will be signed and posed photographs will not be allowed. The Civil Rights Summit will be held at the LBJ Presidential Library located at 2313 Red River Street on The University of Texas at Austin campus. Public parking will be on a limited availability, first come, first served basis in the Manor Garage, located at 2017 Robert Dedman Drive, and in the San Jacinto Garage, located at 2401 San Jacinto Boulevard, for a fee of $3 per hour. For those needing ADA parking, please utilize the signed ADA parking spaces in lots #37, 38, and 39 located on Red River Street between Dean Keeton and Clyde Littlefield Drive. You will not need a Summit parking placard for entry into these lots, but you will need either a state issued handicapped placard or a handicapped license plate. These ADA spaces will be limited and on a first come, first served basis as well. For those with a Summit parking placard, parking will be on a limited availability, first come, first served basis in lots #37, 38, and 39 located on Red River Street between Dean Keeton and Clyde Littlefield Drive at no charge. Please be ready to present the parking placard to the parking attendants on duty as you enter the parking lot. Overflow parking will be available in the Manor Garage, located at 2017 Robert Dedman Drive, at no charge with your Summit parking placard. • From north-bound IH-35, just past the 15th Street exit, move to either of the left 2 lanes to take the lower deck. • From south-bound IH-35, just past the 51st Street exit, move to either of the left 2 lanes to take the lower deck. • Take the Manor Road Exit (exit 235B). • Go west on Manor Road towards The University of Texas campus. • At the first light, Red River, turn right (north). • At the bottom of the hill, turn left into the LBJ Visitors' Parking lot—Lot 38. The entrance is flanked by banners for the library. 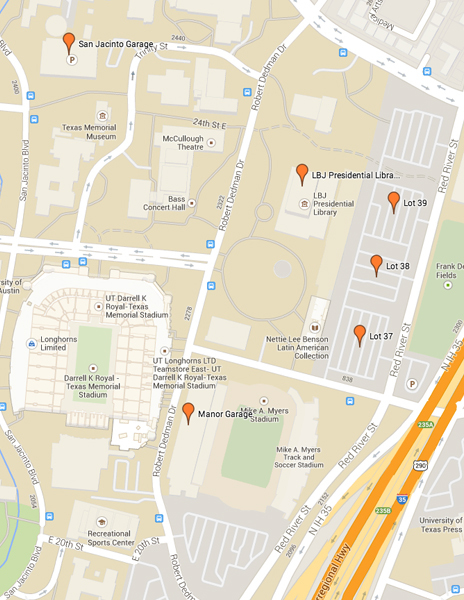 Parking in adjacent UT-permit-only parking lots may result in fines. • The LBJ Library is located on the other side of Sid Richardson Hall, which houses the LBJ School of Public Affairs; walk through the open breezeway to reach the LBJ Plaza and the Library. In advance of the Summit, Emmy award-winning documentary filmmaker, Chairman of The University of Texas Radio Television Film department, and LBJ School of Public Affairs Professor Paul Stekler will host a screening of documentaries and speeches that chronicle the civil rights era and the pivotal role played by President Lyndon Johnson in the passing of landmark legislation. April 1-30, 9 a.m. to 5 p.m.
During the Summit and throughout the month of April, a Cornerstones of Civil Rights exhibit will be on display at the LBJ Library linking the civil rights legacies of Abraham Lincoln and Lyndon Johnson. The LBJ School of Public Affairs, in partnership with the LBJ Foundation and the LBJ Presidential Library, will celebrate the 50th Anniversary of the unprecedented legislative legacy of the 36th President of the United States in a multi-year campaign. Over the next two years, the School will present "50 for 50," a special series of 50 events for 50 years, exploring the critical civil rights issues of our time such as human rights and social justice and calling for a renewed effort to "get things done" in order to improve the lives of all citizens. Please click here for an interactive calendar with more information on events. Witness: Art and Civil Rights in the Sixties, an exhibit to be presented at the Blanton Museum of Art February 15 – May 10, 2015, will offer a focused look at artwork from a decade defined by social protest and American race relations. Featuring approximately 75 paintings, sculptures, and photographs by Richard Avedon, Romare Bearden, Elizabeth Catlett, Mark di Suvero, Barkley Hendricks, Jacob Lawrence, Robert Rauschenberg, Faith Ringgold, Andy Warhol, Jack Whitten and others, the exhibition highlights the wide-ranging aesthetic approaches artists used to address the struggle for racial justice. Situating the artwork within the larger context of the Civil Rights movement, the presentation examines the ways in which artists aligned themselves with the campaign to end discrimination, bridging racial borders through creative work and protest. More information is available here.